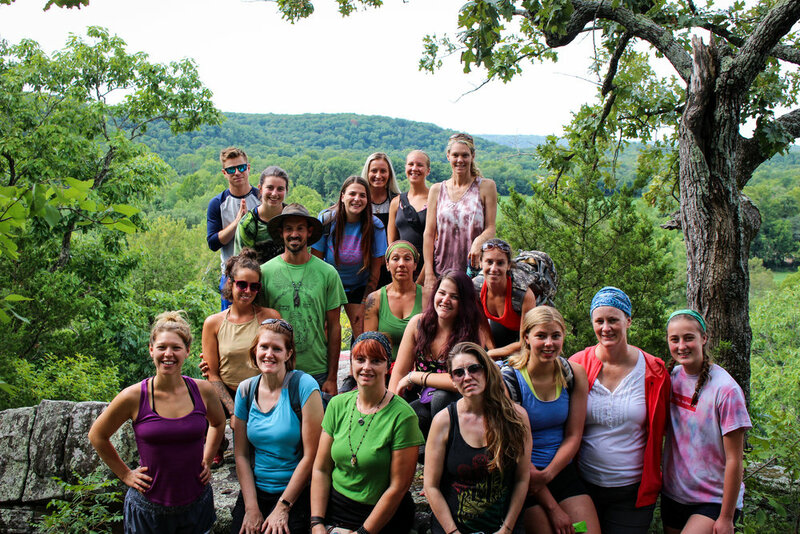 Adventure Tribe Retreats is bringing its love for community, yoga, arts, and music together with YAM Fest. Adventure Tribe Retreats is delighted to announce our first Yoga Arts & Music Festival, a.k.a. YAM Fest! YAM Fest will feature artists, musicians, yoga teachers, and other practitioners of the healing arts for a weekend of fun and relaxation. During YAM Fest you will have many chances to connect with nature, build friendships, indulge in delicious food, and try new experiences. We invite you to unwind, try something new, and come PLAY with us in a 50-year-old, shaded walnut grove alongside the Meramec River in St. Clair, Missouri. The beautiful Lost Hill Lake Events (LHLE) venue offers private access to the river, views of golden hay fields, gentle hills, scenic lookouts, a shaded mature walnut grove, and natural sanctuary from the stressors of everyday life. We are excited to bring this unique event to our beloved homebase and share the magic that is Lost Hill Lake with others. Yoga - YAM Fest will offer up to seven yoga classes and healing arts workshops each day. Whether you have practiced for years or have never stepped foot on a mat - you are welcome! Our mantra is ‘yoga for everyone’ so it doesn't matter if you like it fast, slow, power, restorative, hatha, kundalini, partner, or have no idea what those fancy yoga words mean - we’ve got you covered! Arts - We love artists! At YAM Fest we want to share and enjoy all things artistic and creative! Visual arts, healing arts, natural art, etc. - it’s all art and it’s all beautiful. Enjoy opportunities to view and purchase beautiful creations as well as chances to participate in artist workshops where you can create your own masterpiece! Nature - One thing that makes Lost Hill Lake Events the perfect venue for YAM Fest is its picturesque geography and the short, one-hour drive from STL. Located right on the Meramec River, the LHLE property is 200+ acres of gorgeous farmland, rolling hills, a private lake, shaded walnut grove, secluded hiking trails, and private river access. We encourage you to turn off your phone and immerse yourself in the beauty of the property. There are great chances to view wildlife during the day and to enjoy the sounds of nature as you fall asleep in your tent without all the city traffic or noisy neighbors. Food - At Adventure Tribe Retreats we appreciate foods that nourish the mind, body and soul and believe a vegetarian and vegan lifestyle do that best! Sustainability is one of our core values and we are committed to creating a better planet for all living beings. We are excited to announce that YAM FEST vendors will ALL serve vegetarian and vegan food options throughout the weekend. Additionally, YAM FEST vendors are required to serve food on compostable serving trays with compostable utensils. Community - We're not just hosting a weekend of fun; we are building a tribe! When you participate in an Adventure Tribe Retreats event we know that you will be kind, courteous, and respectful of others and the space we share. Clean up after yourself, and if your friend drops a wrapper, pick up after them, too. Also, remember that this space is gorgeous and we want to keep it that way so we have a leave no trace policy. Everything you bring for camping needs to go home with you. With that being said, let’s have each other’s backs, have some fun and create one awesome and happy YAM Fest! Your General Admission Weekend ticket to this 3-day, 2-night event includes: camping; participation in several daily yoga classes, workshops, informational demonstrations, and guided hikes around the gorgeous Lost Hill Lake family property; live music Friday night, Saturday night, and Sunday morning; private access to the Meramec River and Lost Hill Lake; huge bonfire hangout; and so much more! VIP Ticket* Upgrade - $50 VIP upgrades (on sale until April 17 OR Sold Out) - VIP includes access to VIP lounge, complimentary happy hour Friday and Saturday evening, preferred camping and special edition YAM Fest T-shirt. YAM FEST is in the great outdoors and that means camping, BUT at Lost Hill Lake, we have options! LHLE offers camping, camping equipment rentals, and RV spaces! Excited about a relaxing camping adventure but not excited about the equipment, setup and teardown? Adventure Tribe Rentals is here to help by offering low impact, sustainable camping solutions for new campers, travelers and those seeking a no-work weekend. As part of the tribe you will enjoy premier shaded camping, arrive to a fully set up camp, have access to the Community Canopy and leave the camping cleanup to us. *Tent camping space and activities listed in the description are included in ticket price. *Event takes place Friday May 17, 2019 from 10 a.m. to Sunday May 19, 2019 at 4 p.m.
What should I bring to YAM FEST? If I do not upgrade to an electric site will there be a place to charge my phone? Yes, charging stations will be available but we encourage guests to leave them in the tent and stay present as much as possible. Enjoy the gathering and connect with other participants. Do any activities have an extra fee? Most activities are included in your YAM FEST ticket price. Some additional workshops may have a material or equipment rental fee. Will there be showers at the event? Yes! We have a shower house that you are welcome to use at any time. Please be mindful of others' time and the environment by taking quick showers. We have a deluxe restroom lodge onsite with real flushing toilets and air conditioning in addition to several well-maintained portable restrooms in the camping areas. Do I have to be a yoga guru to attend this event? No! We welcome yogis with all levels of experience, beginners welcomed. Yes, you are welcomed to bring food from home. Coolers, cooking equipment, etc. Glass is NOT permitted. Ice will be available for purchase onsite. Yes! The bar will be open on Friday and Saturday evening from 5 p.m. -10:30 p.m. Outside coolers, drinks, food are not permitted in the venue area during this time. Will there be a place to refill my water bottle? Yes, an ice cold water station for filling reusable bottles will be available under the large pavilion. What time can I arrive on Friday, May 17th, 2019? Our gates open at 10 a.m. If you want to come set up even earlier, check out our "Thursday night camping" add-on option for $30. Yes, you can camp right next to your car or you can park your car in our parking lot and camp in a shady clearing. What time does the event end on Sunday, May 19th, 2019? Activities will end at 2 p.m. and our gates close at 4 p.m.
Is the whole weekend outside? Yes, LHLE is an entirely outdoor venue. Yes. We love animals. We do enforce a extremely strict leash law and require guests to pick up after their pets. Up to date shots and liability waiver required for dogs to enter. No dogs are allowed to be left unattended. No, the venue is not set up for wifi access. Enjoy nature with us. Will there be a kid zone? Yes, this service will be a kid zone with art activities, family yoga, and other fun events for the littles. YAM Fest counts on Volunteers - we need YOU to make YAM Fest possible! Volunteers work in exchange for their ticket. YAM Fest will be lots of fun AND you are committing to working your assigned shifts. Take pride in being a volunteer by reading all the info. THANK YOU! There are NO deadlines! We will accept applications until all volunteer positions have been filled. We recommend applying early to ensure your volunteer position. We will announce on our website when we have filled all positions. Deposit of $150 required to be refunded at completion of volunteer shifts - deposit can be made via check or PayPal. Once application is complete and submitted, you’ll receive a confirmation email. You will be notified when you are accepted. To be accepted you must submit your completed application and deposit via check or PayPal. Bring photo ID to Volunteer check-in at festival to retrieve schedule card. Volunteers are 21 or older. ALL VOLUNTEERS 21 or older are should be accepted when we receive completed application and deposit. You will receive an email confirmation, which is your TICKET. Bring it to check-in only DURING open hours. Schedules! Yay! –Volunteer schedules are sent out two weeks before YAM Fest. We will do our best to have roles established early but there is a chance volunteers may or may NOT receive their *potential* schedule prior to the festival, depending on when they apply. Either way you will pick it up once you arrive at the festival. PLEASE NOTE: Schedules are SUBJECT to CHANGE. We do our best to meet your requests. Thank you for understanding the fluid nature of this type of event. If you have questions or have not heard from us at least 2 weeks before the YAM Fest please email adventuretriberetreats@gmail.com. A deposit fee, which is your ticket plus a no-show penalty, is required. If you don’t complete ALL of your scheduled volunteer hours, your deposit will be cashed/non-refundable. Deposits cannot be a money order. If you don’t have a credit card or checking account, use a friend’s & put your name on the check. IMPORTANT: Drop your signed volunteer card at Volunteer Table once your shifts are completed. If you do not drop off your card before you leave festival, you must send your signed work card in the mail within one week. After 7 days, if we do NOT have your signed shift card your Deposit will be cashed/non-refundable. All DEPOSIT CHECKS will be shredded after we receive your signed card. Check-In times are: Thurs: 8:00 am - 6 pm; Fri: 10 am - 8 pm; Sat: 10 am - 8 pm. *Please note Volunteers can NOT check in on Thursday unless you are scheduled to work on Thursday or have purchased Early-entry camping. Upon arrival, 1st stop at gate and check-in (during check-in times please-NOT EARLY) for ticket & parking pass. Once you are parked, drop off your camping gear, and come to VOLUNTEER STATION for your schedule cards and information. NO CAMPING or RESERVING CAMPSITES BEFORE 3:00 pm ON THURSDAY. Volunteers MUST vacate the festival grounds by Sunday 6pm unless otherwise noted. If you cannot fulfill your volunteer commitment, notify adventuretriberetreats@gmail.com  ASAP. Cancellations without deposit penalty MUST BE AT LEAST 10 DAYS BEFORE THE FESTIVAL IN WRITING (email is good). After that all cancellations (even calling in sick) are considered a NO-SHOW & your Deposit Fee will be cashed. We suggest you find a reliable friend to replace YOU so you do not lose your deposit. How does the scheduling happen? Schedules! Yay! Volunteers typically receive their schedules within two weeks of the event. IF you receive your confirmation and ticket and DO NOT receive a schedule please check your SPAM folder — if it’s not there please email adventuretriberetreats@gmail.com – DO NOT call the office. Once you have been assigned a shift, please fulfill your commitment. If something does come up, please email us ASAP so that we can work to fill your shift! Our email is adventuretriberetreats@gmail.com. Can volunteers request certain shifts? Yes. On the application form, identify job area and shift time preferences. We try hard to make sure everyone gets a shift they’ll enjoy. The sooner you apply the more likely you are to get requested shifts. How early/late do volunteers have to work? During the Festival, shifts can begin as early as 7:30am and end as late as 2:30am. Those scheduled before and after the Festival shifts can expect to work 8am to 6pm. What are the different jobs? So many options- YAM Fest truly could not operate without volunteers! We need strong people for Set Up, Tear Down and Clean Up; good hosts for Hospitality; cheerful help for Greeting and Parking; and all around amazing YAM Festers to work in all the venues on the Festival grounds. Where do I park? You park according to where you are staying, and when you are volunteering. After you check in, you will be able to park and find your campsite. Just don’t be late for your volunteer shift! When do I need to be there? Note WHEN you said you would be arriving and ready to work on your application. We use that to schedule you. Please plan to be on-site 60 minutes prior to the start time of your shift to start your check-in process. Can my child accompany me on my shift? Unfortunately, no. It is important volunteers are focused first on their volunteer work and are fully present during their shift. Can I bring my dog or pets? Dogs are welcome at YAM Fest but may interfere with volunteer responsibilities. Please ask a friend to hang out with your pup during your shift. What cases are deposit checks cashed or cards non-refundable? You did not turn in your volunteer card. You turned in your volunteer card without sufficient signatures from you shift supervisor(s) for EACH and ALL SHIFTS. You turned in your volunteer card with bogus signatures. You did not show up to the festival. Turn in your signed volunteer card once you have completed your shifts. If you do not drop off your card at the Volunteer tent before you leave the festival you must mail to Lost Hill Lake Events, 783 Lost Hill Lake Rd, St Clair, MO 63077 your signed work card in the mail within ONE WEEK (arrive by the following Sunday’s mail). THANKS for volunteering AND taking the time to read! We hope we answered all of your FAQs, if not please email adventuretriberetreats@gmail.com. See you at YAM Fest!